Fact-based account of what went on behind-the-scenes in the early stages of America's race for space! Won for Best Sound Effects Editing; Best Film Editing; Best Sound; Best Score-Bill Conti. 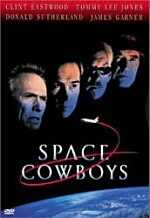 Nominated for Best Picture; Best Supporting Actor-Sam Shepard; Best Art Direction-Set Decoration; Best Cinematography. As usual, Oscar got it wrong for 1983 when the Academy chose Terms of Endearment as Best Picture of that year. As all right-thinking Americans know, the actual best movie of the year was The Right Stuff, about as manly a testosterone-fest as you're likely to find. Guess 1983 was a victory for the women, since Endearment pretty much defined the phrase "weepy chick flick." In the long run, however, I think The Right Stuff has maintained more general appeal than Endearment. I feel the latter has gotten somewhat lost in the continual parade of similar films, whereas few other pictures have spent much time covering the same territory as Stuff, and none have attempted to take on the subject in such an epic style. Although Stuff clearly has a strong historical base, it makes no attempt to provide documentary-style coverage of its subjects. That's pretty much a given in any films that deal with test pilots and the space program; it's larger than life material and we're used to seeing it treated as such. 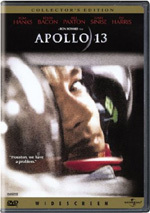 However, films such as Apollo 13 tried much harder to keep things down to earth, as it were. Stuff paints its subjects with an extremely broad brush as it portrays those events in a near mythical manner. That's both a positive and a negative. I think the style does befit the material, since the subjects of Stuff all maintain virtually legendary status. In no way does the film ever try to convince us that it's an objective, realistic presentation of these men; it's all guts and glory from start to finish. While I think that this method works well for the most part, there were times when the excesses of the style started to get to me. On occasion, the film started to veer a little too far away from an objective portrayal of reality and began to turn slightly farcical. Overall, however, it's solid historical fiction and it provides strong, consistent entertainment, something fairly rare for a film that's almost three and a quarter hours long. Inevitably, it does drag at times, but not frequently. That consistently engaging quality of Stuff brings me to another factor that's both a strength and a weakness: the ensemble cast. Don't get me wrong - this is an amazingly solid bunch of actors who all provide fine work, as there's not a dog in the bunch. However, the cast is so large and the film tries to cover so many characters that some of the picture's emotional impact gets lost along the way. Stuff features no one main character, but five different roles can be considered the male leads: Chuck Yeager (Sam Shepard), John Glenn (Ed Harris), Gordon Cooper (Dennis Quaid), Gus Grissom (Fred Ward), and Alan Shepard (Scott Glenn). Yeager provides the thread that winds the piece together. He may have a bit more screen time than the other four, but it's probably pretty close. As far as those four go, the movie seems to cover them all fairly equally. Add in the wives of these characters - all of whom play semi-significant roles except Louise Shepherd (Kathy Baker), who largely gets lost in the mix - plus about a trillion other supporting roles and you have one huge cast. This is probably a good thing for such a long movie; the more characters we have, the more likely our attention can be maintained, since we won't get too bored if we don't like a few of them. I simply think the film might have worked a bit better if the focus had been pared down a bit. However, by necessity that change would have made the film less of an epic, and its grand scope is one of the reasons we maintain interest in it. Also, the aforementioned terrific acting helps. In such a large cast, it's hard to pick any standouts, especially since all of them are so good. If I had to pick the best, I'd go with three: Shepard, Quaid, and Harris. Shepard offers a portrait in simplicity as Yeager, who comes across as smart, strong, virile and sensitive all at once. Quaid's work as Cooper was somewhat cartoony but in a good way; he made his character quite vibrant and alive. Harris does an excellent job of making Glenn a sweet, good-natured guy without making him too much of a sanctimonious goody-goody. Overall, The Right Stuff continues to offer quite exciting and vibrant filmmaking. While it may try to be excessively heroic and larger than life, so few films attempt to reach the status of "epic" anymore that it's awfully good to see one that does, and succeeds pretty well. I don't know if Stuff is the best movie about the space program, but it's very high on that list. 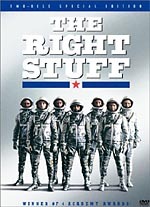 The Right Stuff appears in an aspect ratio of approximately 1.85:1 on this single-sided, double-layered DVD; the image has been enhanced for 16X9 televisions. The text on the back of this release referred to the transfer as “pristine”, which made me wonder if they recently changed the definition of that word. Although much about the picture looked very good, it seemed far from pristine. Sharpness usually appeared positive, as only a few small exceptions occurred. Some wider shots came across as slightly soft. However, most of the movie was well defined and distinct. Jagged edges and moiré effects caused no problems, and only a smidgen of edge enhancement showed up on a couple of occasions. Stuff featured a natural and warm palette that came across well here. The colors always remained tight and accurate. Colored lighting looked solid and failed to suffer from any bleeding or noise. Black levels were deep and dense, while shadows seemed nicely delineated. Low-light shots looked clear and appropriately detailed. Where Stuff lost most of its points related to source flaws. Throughout the movie, I noticed quite a few examples of specks, spots, grit, marks, scratches, streaks, and vertical lines. Some of the flaws came from stock footage, like the opening shots of Cocoa Beach, but that didn’t explain all – or most – of them. The film didn’t seem horribly full of defects, but they came across as heavier than I expected of a 20-year-old flick, and they forced me to drop my grade to a “C+”. How did the image of this new version of The Right Stuff compare with the original from 1997? For the most part, the pair seemed pretty similar. Both shared the same print defects and other issues. However, the old one displayed edge enhancement that appeared a bit more noticeable, and it also suffered from moderately intrusive compression artifacts. I thought the original merited a “C-“ for picture, so this one’s “C+” marked a bit of an improvement, but not a huge one. While the picture of The Right Stuff hasn’t aged terribly well, the film’s Dolby Digital 5.1 soundtrack worked remarkably nicely. Identical to the remix accorded the original DVD release, I found it tough to believe this track came from a moderately old flick. The soundfield seemed wonderfully broad and vivid. In addition to the expected solid stereo imaging for the score, effects demonstrated great activity and involvement. The front speakers boasted fine breadth and dimensionality. Elements seemed accurately placed and they moved smoothly across the speakers. The surrounds kicked in with a lot of useful material as well. General ambience worked nicely throughout the movie, and the louder scenes displayed terrific vividness. For example, the flight deck on Glenn’s Navy carrier created a great sense of place, and the jet flights immersed us in the action. Even press conference shots demonstrated a nice feeling of the location. The soundfield really complemented the visuals. Audio quality also worked very well, especially when I considered the age of the material. Speech lacked any problems like edginess, as the lines consistently sounded natural and distinct. Some of the synthesized parts of the score appeared slightly dull, but most of the music came across as bright and dynamic. The score mostly was clear and crisp. Effects also functioned well. A few jet shots displayed slight distortion, but those examples stayed minor, and the other elements seemed concise and accurate. Bass response was simply terrific, as low-end material sounded deep and firm and also presented a solid bang. Overall, the audio of The Right Stuff functioned extremely well. While the original DVD of The Right Stuff included only a trailer and some text extras, this new special edition provides much more. Only a smattering of components show up on DVD One. We get a listing of the four Academy Awards that the film won, and we also find two screens that list some members of the Cast and Crew. Oddly, although the original DVD presented biographies for these folks, this one just shows their names. Why not port over material that already exists? As we move to DVD Two, we open with two separate “scene-specific” audio commentaries. What does that mean? For each of the tracks, we watch 24 minutes and 25 seconds of the movie along with the remarks of various participants. The programs jump between various parts of the film; both of the commentaries cover the exact same movie snippets. While this doesn’t sound as intriguing as a full-length commentary might, at least it prevents us from sitting through the whole 193-minute flick to hear only 49 minutes of statements. The first commentary comes from General Chuck Yeager and actors Ed Harris, Dennis Quaid, Fred Ward, Barbara Hershey, Veronica Cartwright, Pamela Reed, Donald Moffat, David Clennon, Jeff Goldblum and Harry Shearer. All were recorded separately for this heavily edited piece. The track covers topics like preparation for the roles, stories from the set, and the real-life events behind the movie. On the second track, we hear from director Philip Kaufman, co-producers Robert Chartoff and Irwin Winkler, composer Bill Conti, cinematographer Caleb Deschanel, and visual effects supervisor Gary Gutierrez. They touch on some of the same topics heard in the first track, and they also get into the technical elements of making the movie. With so many participants, there no way these commentaries wouldn’t become disjointed, and that’s the main problem I encountered here. While they definitely go through a lot of good material, the subjects jump so quickly and so radically that it can become disorienting. There’s enough worthwhile information on display here to allow the commentaries to prosper anyway, but I don’t much care for the format. It makes the details less intelligible and coherent. At 86 minutes and 30 seconds, John Glenn: American Hero provides the longest supplement attached to Stuff. 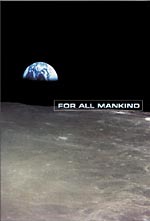 Narrated by Timothy Bottoms, the 1998 PBS documentary features archival footage plus modern interviews with Glenn, military friend Thomas Miller, biographer Frank Van Riper, astronaut Scott Cooper, NASA administrator Daniel Goldin, John Pike of the Federation of American Scientists, Library of Congress aerospace specialist Marcia Smith, Jet Propulsion Laboratory Director Edward Stone, wife Annie, daughter Lyn Freedman, and son David. While “Hero” covers all areas of Glenn’s life and career, it mostly focuses on his 1998 space shuttle flight. The show rips through Glenn’s early life, military career, astronaut experience and foray into politics in just about 37 minutes, which leaves almost 50 minutes dedicated to modern space flight. The program relates some notes about future space exploration goals and then provides a detailed examination of Glenn’s journey. ”Hero” includes quite a lot of good material, but it comes in a flawed package. For one, I’d really have preferred more emphasis on Glenn’s life and less about the shuttle trek. It’s fun to see the facts behind Stuff, and it’s also nice to learn more about Glenn’s background. There’s just not enough of this, and the study of the shuttle flight feels too much like an educational video aimed at seventh graders. That doesn’t mean the program tries to cater to younger viewing tastes, however. Actually, “Hero” plods along at a flat pace. It moves very slowly and makes a lot of the material feel much less exciting than it should. Educational shows don’t need to be dull, but “Hero” displays a lack of imagination and zest behind its production. The information on display makes it worth a look for those interested in the topics, but the execution doesn’t allow the material to flourish. Additional behind the scenes programs appear in the “Documentaries” domain. Though split into two parts, the first pair really comprise one longer feature. Realizing the Right Stuff runs 21 minutes and five seconds and comes narrated by actor Levon Helm. It presents film clips, writer/director Philip Kaufman, author Tom Wolfe, producers Robert Chartoff and Irwin Winkler, director of photography Caleb Deschanel, technical advisor General Chuck Yeager, actors Dennis Quaid, Ed Harris, Fred Ward, Pamela Reed, Veronica Cartwright, Jeff Goldblum, Harry Shearer, David Clennon, Donald Moffat, and Barbara Hershey. Among the topics covered, we hear about adapting the book, getting studio support, casting, various locations and shooting logistics, recreating historical materials, research by the actors, and various anecdotes from the shoot. Essentially “Realizing” follows the movie from its genesis through the end of principal photography. T-20 Years and Counting picks up with the post-production process. In this 11-minute and 28-second program, we hear from Wolfe, Chartoff, Winkler, Kaufman, Deschanel, Cartwright, Quaid, Harris, Moffat, Ward, Shearer, special visual effects supervisor Gary Gutierrez, and composer Bill Conti. This piece covers visual effects, failed attempts with motion control, experiments, editing, adding the score, the Washington DC premiere, and the movie’s reception and the connection to Glenn’s presidential campaign. Overall, “Realizing” and “Years” offer a decent look at the film. They hit on all the major topics and do so in a reasonably entertaining and concise manner. Still, I can’t help but feel that they seem rushed. At about 32 and a half minutes, the two together create an acceptably long program, but it just doesn’t seem like enough. Subjects fly by awfully quickly, and most fail to get much exploration. The pair give us a moderately satisfying but somewhat hurried examination of the making of the movie. Lastly, The Real Men with the Right Stuff runs 15 minutes and 25 seconds. It looks at exactly what the title implies: the actual guys involved with the reality behind the flick. We get some quick comments from author Tom Wolfe but mostly hear from General Chuck Yeager, Commander Scott Carpenter, Colonel L. Gordon Cooper, and Captain Walter M. Schirra. Easily the best of the DVD’s programs, “Real” gives us a tight and fun examination of their experiences. They also discuss the liberties taken by the movie. We get a surprisingly full look at what they did, and they all seem nicely blunt and honest. You won’t find any actual dirt dished here, but the facts are presented in a lively manner, and the show is quite entertaining and informative. Next we locate 13 additional scenes. These fill a total of 10 minutes and 50 seconds, and nothing major appears here. Most of the pieces offer minor cuts from existing scenes. The longest shows Cooper as he chats with Slayton and Grissom about how to smooth over the nurse during the try-out process. Otherwise, these are all fairly short bits that are mildly interesting to see at most. In addition to the film’s theatrical trailer, DVD Two ends with an Interactive Timeline to Space. This begins on May 5 1961 with the launch of Freedom 7, and it progresses through 14 significant dates all the way into the future with the projected flight of an orbital space plane in 2012. With some of the dates, we get a short piece of film or video and narration from Levon Helm to describe the significance of the events. Others show text and photos. These remain short and fairly perfunctory episodes and the scope seems limited, but the “Timeline” still gives us a decent overview of the US space program. I like the fact it doesn’t shy away from negative events, as it covers the notable disasters suffered by NASA. A vivid and heroic epic, The Right Stuff tells a dynamic tale with fervor and might. It treats its subject in a gripping and mythological way that makes it a consistent treat to watch. The new DVD’s transfer only slightly improved upon that of the original release, and it remained somewhat problematic, largely due to source flaws. However, the DVD featured a terrific audio mix and included a fairly nice set of supplements. While not a definite repurchase for owners of the prior release, I think fans of the movie will want the new two-DVD set. Without question, this is the one for folks who don’t own the previous edition; it’s undeniably the best DVD of The Right Stuff available.